Lars, I like how humble this post is. Thanks for showing your thought patterns here. In the case where acquisition is high and churn is high (say 40/40), my first thought is: why the heck is churn so high? Is the product not delivering on the promises made in the offer? Is it hard to implement? Is it full of bugs? Is it not interfacing with the customer’s existing systems? Do they not know how to use it? As you touched on so nicely, word-of-mouth sales come from people… people who love your product… people who have benefited enormously from it. If that isn’t happening, it is a symptom of a bigger ‘customer success’ problem… which is really a product development, marketing, and sales problem. If customers aren’t succeeding with your product, you’re in a world of hurt. I completely agree Carl! It’s definitely not easy to get everything to the point where your customers truly love what you’ve built. > thought is: why the heck is churn so high? Imagine a problem solving web site, e.g. online coaching against sleep deprivation for parents with a new-born child. A customer signs up because (s)he is sleep-deprived and wants to be coached. The site has excellent coaching videos and other material so that the customer solves his/her problem in 2.5 months. (S)he is happy, recommends the online coaching site to 2 friends with a similar problem and then unsubscribes. The 2 friends sign up, later. 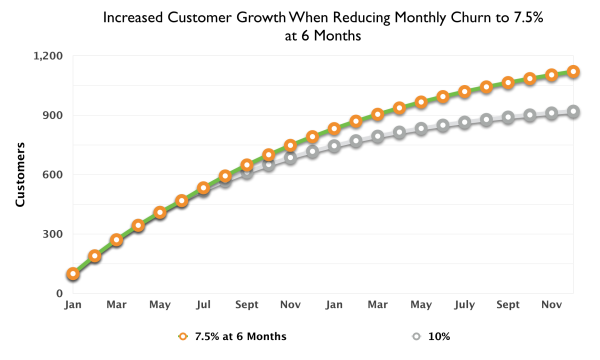 In this case, the churn rate is 100/2.5=40% per month, right? And there is no problem of customer satisfaction with this. It is just the normal everyday behavior. Now, Carl and Lars: How about growth for this hypothetical online coaching site? Show me the numbers, please! 1) Online dating. The more successful that an online dating site is, the higher the churn rate will be. If the company successfully matches people for relationships, those same users will no longer need the service. 2) A mattress store. No matter how good the customer service, product selection, or any other variable of the business, customers will only buy a mattress once every few years. And if the store is really doing a great job, every customer will only need a new mattress once a decade. So the annual re-purchase rates are atrocious which is completely normal. The main lesson here is to not force a subscription model on a business that isn’t fundamentally a subscription business with ongoing value. For your coaching website, I would treat it as an online service business where payments are spread out over several months. You could probably raise your rates by selling your solution as a single package that you implement over a 2-3 month timeframe. Since you can’t rely on recurring revenue for your business, growth is heavily dependent on acquisition. You’ll want to double-down on the quality of the program to drive word-of-mouth referrals and make sure you’ve built a profitable marketing funnel from 2-3 channels to accelerate growth. This is great Lars. It’s really deepened my understanding of the Lean Start Up engines. I had the same feeling as you about the sticky engine not really being a growth engine. This made me question Eric Ries’ assertion that you should only focus on one engine. This clarification of growth through retention coupled with WOM gives me confidence that we can really focus on the sticky engine for a while. just a quick note of thanks. I am currently reading lean startup and I feel like Eric has been able to put into words so many things that I was just able to just barely guess or suspect. That being said, the strong suggestion from Eric is for startups to focus on one engine of growth. I get that between Paid and Viral, but it confused me that Paid and Sticky shouldn’t be focussed on at once. For me these two tactics go hand in hand to increase Customer lifetime value. Thanks for putting this discussion out in the open. And I agree, I no longer believe these engines are exclusive. Every company I’ve worked with has multiple sources of growth. Yes, there’s usually a dominate source. And there’s an art to maintaining and growing multiple sources. But every channel reaches a limit sooner or later, te best businesses stack several growth sources over time. Lars, and what about content marketing? This seems a way to grow business but unpaid, not viral and without much Word of Mouth (although they can happen). I’m thinking about small service oriented businesses who use this. It might not be very fase though. Content marketing is definitely a legitimate channel, it’s usually the primary channel that I build businesses with. Using Ries’ framework, it would be part of the paid engine. You spend money or time on content, that content brings customers, then you increase the money/time that you spend. In practice, content and true paid marketing operate completely differently. I haven’t come across a single team that’s world-class at both. I’ve tried to do both myself and have failed. It usually comes down to the philosophy and preferences of the founding team. If they’re extremely data-driven and willing to ship anything that converts, paid is usually the best route. If the founding team is more values-first and hesitant about shipping aggressive campaigns, content is the better option. At least in the online marketing world.